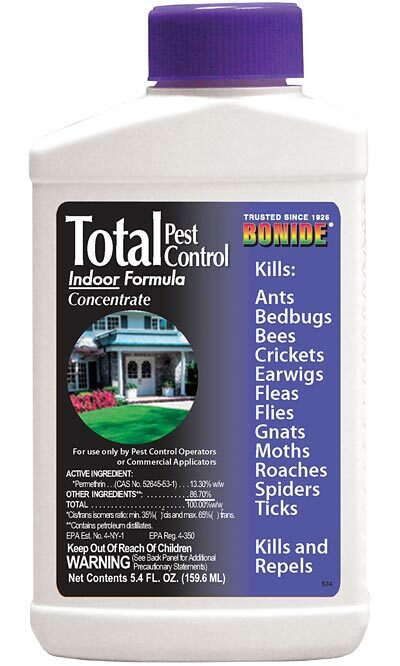 Control a wide variety of indoor insects with the Bonide Indoor Formula Total Pest Control Concentrate. When mixed and used as directed, this insecticide concentrate eliminates damaging and annoying insects such as ants, roaches, waterbugs, ticks, bees, wasps, fleas, moths, and spiders that invade your pantry, bedding, kitchen, carpets, and clothing. You may also apply this product to outside building surfaces to prevent insect infestations. Apply to surfaces of screens, eaves, patios, garages, and other areas where pests congregate. For residual and contact control of these insects, spray thoroughly into cracks and crevices, moist areas, openings around pipes and drains, under refrigerators, and around baseboards and storage areas. Kill and repel damaging insects in your home with this Indoor Formula Total Pest Control Concentrate. Made in the USA. Note: This case pack includes 4 bottles of Bonide Indoor Formula Total Pest Control Concentrate.